If you choose the "30-Day Free Trial" plan we do need to keep your credit card number on file. We will send you a reminder email 10 days before the end of your trial. Your credit card will not be billed if you cancel within the 30-day trial period. 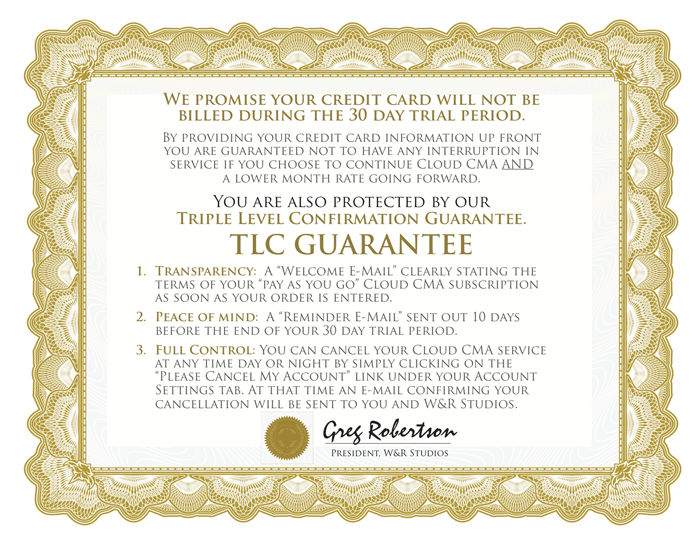 All Cloud CMA Team/Broker Edition subscriptions require a 1 year commitment and credit card to sign up. If you cancel within the 30 day trial period you will not be charged. Only one free trial account per customer! Cloud CMA is a product of W+R Studios.